Running a hot water wash with warm rinse costs 5 to 10 times more than a cold wash and rinse. Owning and using efficient washers and dryers save you money not only by reducing your energy and water costs, but also by extending the life of your clothes. Integrated Modified Energy Factor (IMEF): a measurement of energy efficiency that takes into consideration the energy used during the washing process and while on standby, the energy used to heat the water, and the dryer energy required for the removal of the remaining moisture in the wash load; the higher the IMEF, the more efficient the clothes washer. Why should I worry about energy use in the laundry room? The laundry room can be a big consumer of energy. According to the ENERGY STAR website, the typical U.S. household washes about 300 loads of laundry every year. Today, a typical clothes washer uses 23 gallons per load whereas full-sized washers earning the ENERGY STAR label use 13 gallons per load (ENERGY STAR, n.d.a). The laundry room also generates a large amount of unwanted heat and humidity in summer, so it makes good sense to think about location options as well as the efficiency of your appliances. Where should the laundry area be located? How can I be more energy efficient with my current washing machine? Using less water and cooler temperature water are the two primary ways to reduce the amount of energy used for washing clothes (U.S. Department of Energy, May 2014). You can reduce the clothes washer’s energy load by half just by switching your temperature setting from hot to warm. Therefore, use cold water whenever possible and only wash full loads if your machine has no adjustment for load size. What should I look for in a new washing machine when it comes to energy efficiency? Before you start shopping, decide the tub capacity you need to fit your household’s needs—standard sizes for residential use typically range anywhere from 2.0 to 3.5 cubic feet. Although larger tub capacity machines hold more clothes, they also use more energy. Don’t forget to consider the amount of physical space you have available for the machine. Figure 1 represents the ENERGY STAR certified label that can be used only on products that are more energy efficient in their product class yet don’t sacrifice performance, features, or comfort. Depending on your local utility rates and your household’s usage habits, ENERGY STAR certified clothes washers can save your household about $40 per year in utility bills (ENERGY STAR, n.d.a). Washers come in two basic designs: front-loading or top-loading. Models that have earned ENERGY STAR certification are available in both designs. To search for special offers and state or utility rebates, etc. enter your zip code at this ENERGY STAR page and at the Database of State Incentives for Renewables and Efficiency® website. In addition to size, design, and ENERGY STAR qualification, you still need to know just how much energy and water a clothes washer uses in order to make an informed decision. . Clothes washer energy and water efficiency are measured in two ways (ENERGY STAR, n.d.b). Integrated Modified Energy Factor (IMEF): a measurement of energy efficiency that considers the energy used during the washing process and while on standby, the energy used to heat the water, and the dryer energy required for the removal of the remaining moisture in the wash load; the higher the IMEF, the more efficient the clothes washer. Integrated Water Factor (IWF): a measurement of water efficiency that considers the gallons of water used per cubic foot of capacity of the tub; the lower the IWF, the less water the washing machine uses and thus the more water efficient. Therefore, this is a measure of water efficiency that is independent of the capacity of the unit. Visit this listing of ENERGY STAR-certified residential clothes washers to view the specific IMEF and IWF information for clothes washers that are ENERGY STAR certified along with other information that may be helpful in making a purchasing decision. Front-loading clothes washers are often designed to use high-efficiency detergent as regular detergent may create too many suds affecting the washing ability and rinsing performance of the machine. The ENERGY STAR website warns that using the incorrect type of detergent could lead to odor and mechanical problems. They also recommend, especially on front-loading models, that the clothes-washer door be left open for an hour or two after use to allow moisture to evaporate, while making sure no children or pets have access to the machine. Lastly, some manufacturers recommend a periodic special rinsing or cleaning of the machine’s tub to help reduce the risk of mold or mildew. In all situations, follow the product owner’s manual to determine the best guidelines for your particular model. 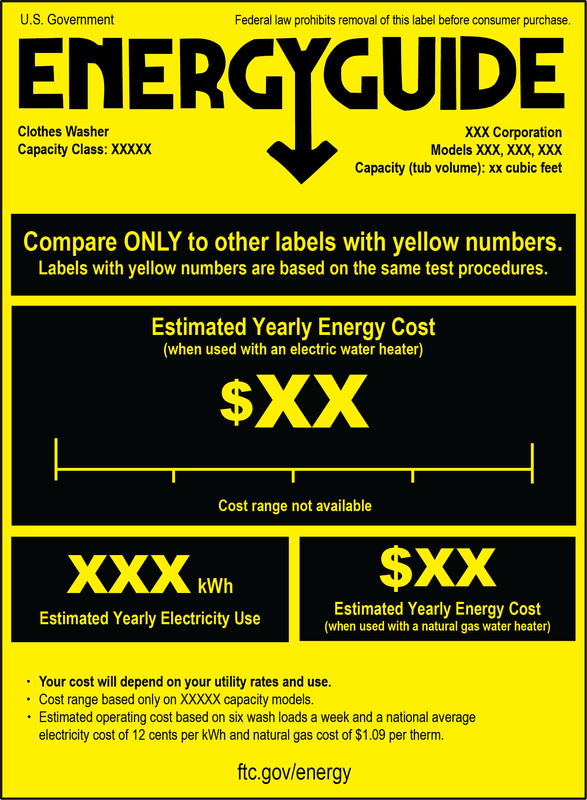 The yellow EnergyGuide label that appears on all new washing machines includes information on the estimated yearly operating cost (with both an electric and a natural gas water heater) and the estimated yearly electricity use of similar models and capacities. See Figure 2 for an example of the current EnergyGuide label for a clothes washer without any specific model or brand listed and Figure 3 for an example indicating the clothes washer is also ENERGY STAR certified. Special note: When comparing EnergyGuide labels, be sure to look at the tub capacity listed on the label. Note that these EnergyGuide label examples, which reflect updated testing procedures, are different from those you may have seen in the past. 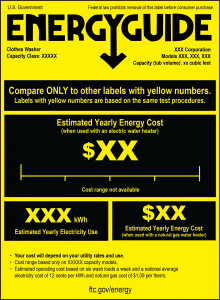 Previous labels feature the numbers in black while these “transitional” new labels feature bright yellow numbers and were required on new clothes washers manufactured beginning March 7, 2015. So before comparing the features of the different models, make sure you are comparing models tested with the same energy efficiency measures so you can make a more accurate comparison. The Federal Trade Commission has more information about reading the label here. To save even more energy—both the energy needed to pump, pipe, and purify water and the energy saved from not having to remove water and repair or replace water damaged structures and belongings due to an unexpected water leak—look for leaks, crimps and cracking in the water-supply hoses to your clothes washer every six months. Did you know that in a review of 525 washing-machine-related home insurance claims, more than half were caused by failures in the water supply line (Insurance Institute for Business and Home Safety (IBHS), n.d.) After the deductible was paid, these failures cost an average of more than $5,300 per incident. More than 78% of the hose failures occurred in washing machines less than 11 years old. IBHS recommends that you replace the water-supply hoses every five years, even if you don’t see an obvious problem. This is both an energy and water saving idea. In addition, learn how to turn off the water to all water-using devices in your home so that in the event of an actual water leak or when you are away from your home—especially for extended periods of time—you know how to operate the valves and are prepared to act quickly. Additionally, it is a good idea to only operate water-using devices while you are awake and at home. Because water damage is both costly and annoying, you may also be interested in reading this article on washing machine failures by Matthew Kenney. 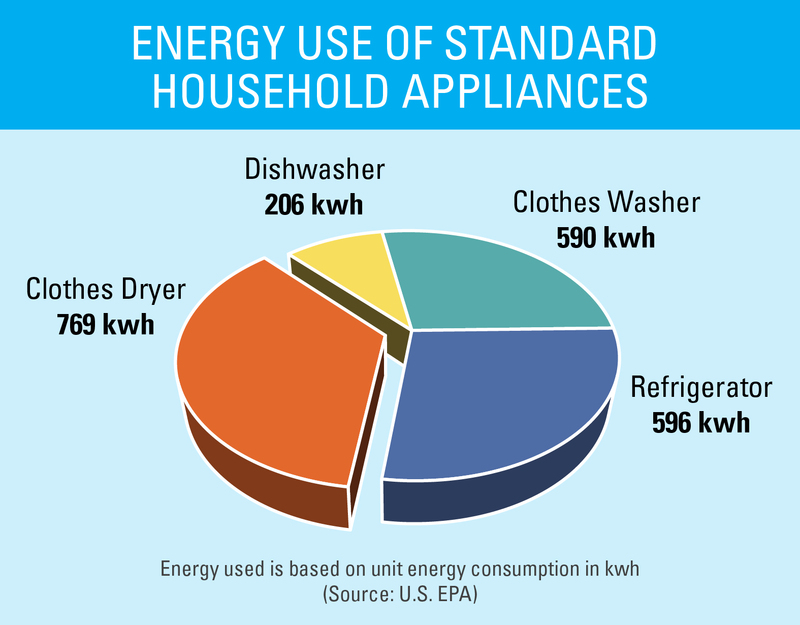 As reported by ENERGY STAR, clothes dryers use more energy per year (769 kWh) than any other standard household appliance, which includes the clothes washer (590 kWh), dishwasher (206 kWh) and refrigerator (596 kWh) (n.d.). ENERGY STAR criteria for clothes dryers were first established on May 19, 2014. However, there are no EnergyGuide label for clothes dryers at this time. Read here about the types of clothes dryers available, i.e., electric, gas and heat pump, as well as what should be considered in the purchasing decision. This same website also includes other useful suggestions in both what features to look for and how to operate it for best performance. All clothes dryers manufactured on or after January 1, 2015, had to meet a higher federal minimum energy standard. See specific details as found in Table 2. For comparison, you can see the ENERGY STAR requirements in this chart, and find and compare products here. The exhaust system of the dryer also merits attention. Try to have as short and straight a duct run as possible to the outside, and make sure the duct is made of smooth metal. Part V, Chapter 15, Section M1502 of the 2014 Florida Building Code: Residential® and Section 504 of the 2014 Florida Building Code: Mechanical® contain the code requirements relating to dryer exhaust systems. Flexible plastic or vinyl duct should be avoided because they restrict air flow, can be crushed, may not withstand the high temperatures of the dryer or could cause a fire. Remember, dryer vents should also be equipped with a backdraft damper to prevent uncontrolled entry of outside air into the home. Dryer exhaust ducts routinely should be cleaned to ensure all lint and debris is clear. In some instances this has been accomplished by unhooking the duct and forcing air through it to the outdoor vent with something as simple as a standard yard leaf-blower or a “shop” vacuum cleaner that can blow air out. Because the laundry area accounts for such a large percentage of any household’s energy usage and resulting utility expense, it makes sense to weigh all of your options from the layout of the area to your selection of appliances and the necessary accessories that can enhance optimum performance. Remember, too, that proper maintenance of your appliances will not only extend their “lives,” but also your dollars. Federal Trade Commission. (July 2013). EnergyGuide labels: Templates for manufacturers. Retrieved May 20, 2015. Federal Trade Commission. (January 2015). Shopping for home appliances? Use the EnergyGuide label. Retrieved May 20, 2015. Florida Building Code 5th Edition: Mechanical®. (2014). Exhaust systems — Chapter 5. Retrieved May 20, 2015. Florida Building Code 5th Edition: Residential®. (2014). Exhaust systems — Chapter 15. Retrieved May 20, 2015. Insurance Institute for Business and Home Safety. (n.d.). Washing machine failure risks. Retrieved May 20, 2015. Kenney, M. (March 6, 2015). Trends in water losses resulting from washing machine failures. Retrieved May 20, 2015. Miller, C., Sullivan, J., and Ahrentzen, S. (2012).Energy Efficient Building Construction in Florida. ISBN 978-0-9852487-0-3. University of Florida, Gainesville, FL. U.S. Department of Energy. (n.d.) Database of state incentives for renewables and efficiency (DSIRE®). Retrieved May 21, 2015. U.S. Department of Energy. (May 2014). Energy Saver: Tips on Saving Money & Energy at Home. Retrieved May 20, 2015. U.S. Department of Energy. (n.d.). Residential clothes washers. Retrieved May 20, 2015. U.S. Department of Energy, Building Technologies Office. (n.d.). Residential clothes dryers. Retrieved May 21, 2015. U.S. Environmental Protection Agency, ENERGY STAR. (n.d.). Clothes dryers for consumers. Retrieved May 20, 2015. U.S. Environmental Protection Agency, ENERGY STAR. (n.d.b). Clothes dryers key product criteria. Retrieved May 20, 2015. U.S. Environmental Protection Agency, ENERGY STAR. (n.d.a). Clothes washers for consumers – buying guidance. Retrieved May 20, 2015. U.S. Environmental Protections Agency, ENERGY STAR. (n.d.). Clothes washers key product criteria. Retrieved May 21, 2015. U.S. Environmental Protections Agency, ENERGY STAR. (n.d.). ENERGY STAR certified residential clothes dryers. Retrieved May 24, 2015. U.S. Environmental Protection Agency, ENERGY STAR. Special offers and rebates from ENERGY STAR partners. Retrieved May 21, 2015. This document is FCS3260, one of an Energy Efficient Homes series of the Department of Family, Youth, and Community Sciences, Florida Cooperative Extension Service, Institute of Food and Agricultural Sciences, University of Florida. This material was initially prepared June 2008 with the support of the Department of Environmental Protection, Florida Energy Office, which is now the Office of Energy, Florida Department of Agriculture and Consumer Services. This revised version was prepared June 2012 and updated May 2015 with the support of the Florida Energy Systems Consortium. Any opinions, findings, conclusions, or recommendations expressed herein are those of the author(s) and do not necessarily reflect the views of the sponsoring organizations. Please visit the EDIS website. Kathleen C. Ruppert, Extension scientist, Program for Resource Efficient Communities; Wendell A. Porter, lecturer and P.E., Department of Agricultural and Biological Engineering; Randall A. Cantrell, assistant professor, Department of Family, Youth, and Community Sciences; and Hyun-Jeong Lee, former assistant professor, Department of Family, Youth, and Community Sciences, University of Florida, Gainesville, FL 32611.